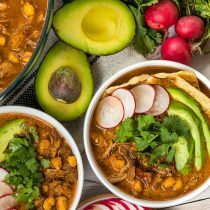 Steamy Spicy Slow Cooker Chicken Enchilada Soup topped with cheese, sour cream, avocado, and cilantro. 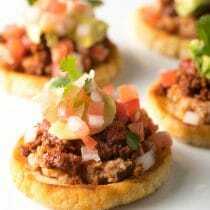 Big latin flavor that is easy on the waistline! 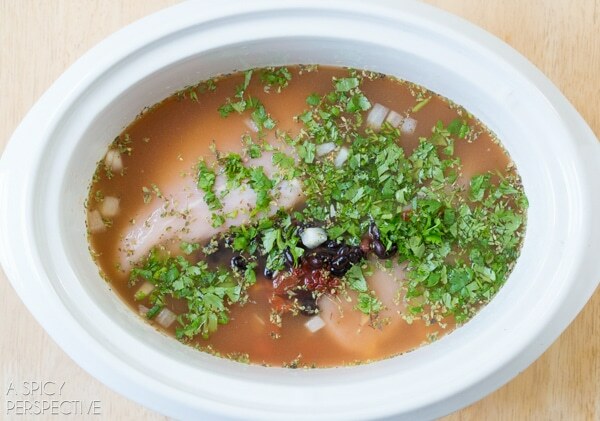 There’s nothing better than a warm comforting bowl of soup. Well… maybe one thing. 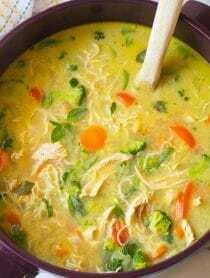 A warm comforting bowl of soup that’s not going to settle around your mid-section. 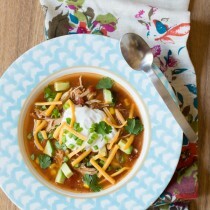 My very talented friend Gina Homolka from Skinnytaste.com has just published a cookbook filled to the brim with recipes like today’s Slow Cooker Chicken Enchilada Soup, that are bursting with flavor, yet light and healthy. Gina on the left, Me on the right. 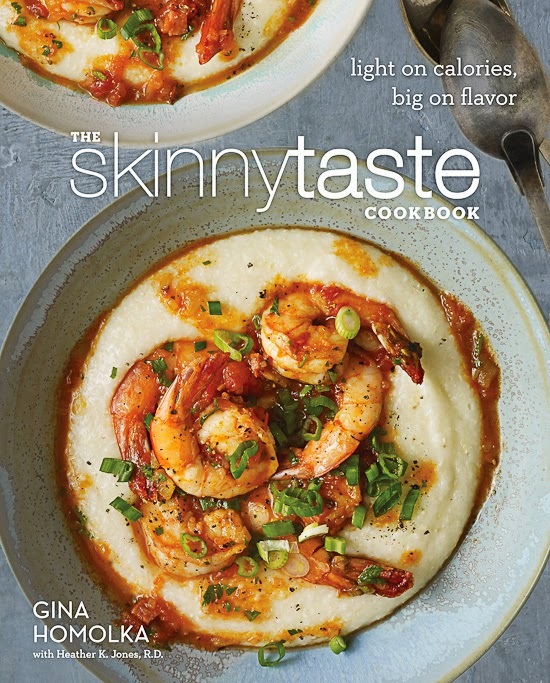 The Skinnytaste Cookbook is a collection of 150 recipes, 125 new dishes + 25 favorites from Gina’s blog, that will wow your tastebuds while keeping you on the straight and narrow. 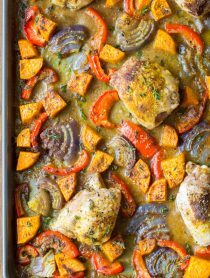 Each recipe offers extra cooking and preparation tips, plus the nutritional facts to help make your weight-loss journey simple. Skinnytaste.com started with Gina’s personal journey to shed a few extra pounds and has grown into an online force, helping millions of readers eat well, while eating well. The Skinnytaste Cookbook was the #1 preordered book on Amazon and continues to be the #1 diet-related cookbook sold online. After flipping through the gorgeous pages of The Skinnytaste Cookbook I settled on Slow Cooker Chicken Enchilada Soup, as my first recipe to try. 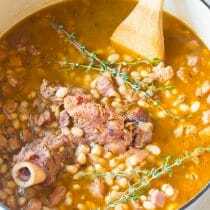 I love slow cooker recipes like this, that you can throw in the crockpot and forget for a while. 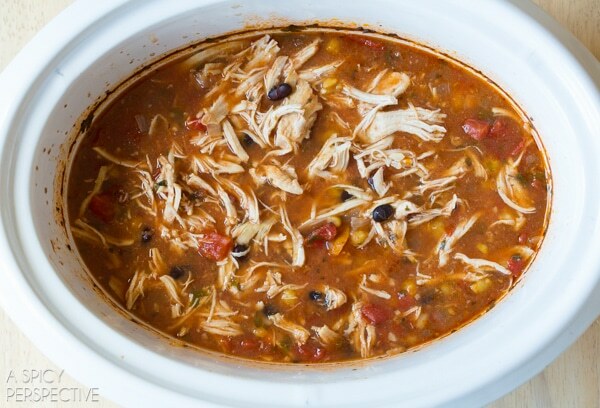 The combination of smoky chipotle peppers, black beans, shredded chicken, and spicy tomato broth makes this Slow Cooker Chicken Enchilada Soup a recipe I will serve again and again. In fact, my kids asked if they could eat the leftovers, which is something that never happens in my house. You can find The Skinnytaste Cookbook on Amazon, on Barnes&Noble.com, and at most bookstores. Gina’s brilliant book is a saving-grace for those of us watching our weight, while still wanting to enjoy the dishes we love! For the Soup: In a medium nonstick skillet, heat the oil over medium heat. Add the onion and garlic, then cook until soft, about 3 minutes. Scoop into the slow cook along with the rest of the soup ingredients. Cover and cook on low for 4 to 6 hours. NOTE: This recipe is paraphrased from The Skinnytaste Cookbook. Read chicken broth label to make sure it’s gluten free. This may be my new favorite soup! I followed the recipe as written, refrigerated overnight and heated some for lunch today. Out of this world, even without the toppings. I crumbled a few baked tortilla chips to my bowl just to add a little crunch. Highly recommend! 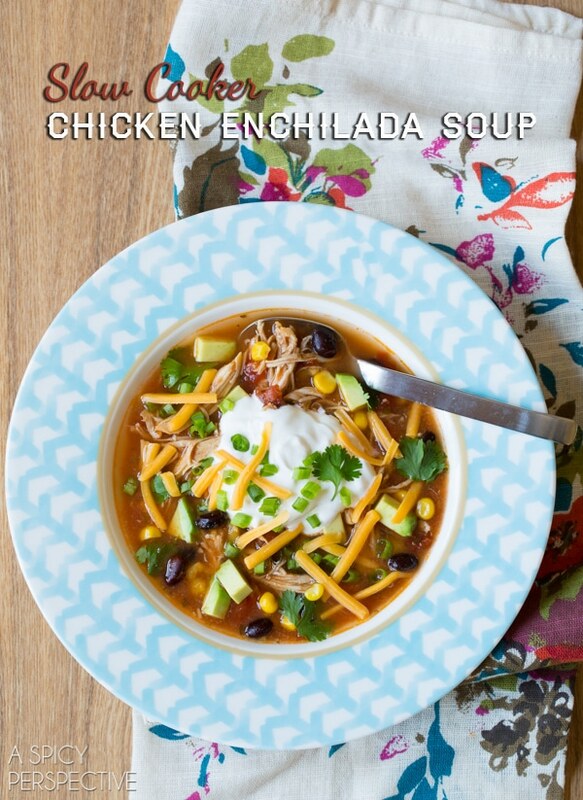 This chicken enchilada soup is the best! I’ve gotten so many compliments on it! Making it again as I type! Thanks for sharing! Made this exactly as the book called for, and it was delicious…even better the next day. Great recipe and the cookbook is beautiful! Looks terrific — will definitely be making this for a chilly Friday night here in Idaho! 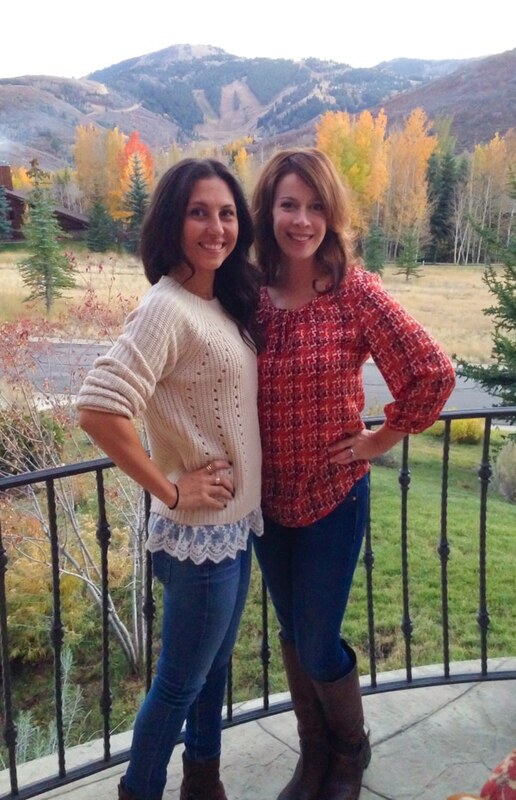 Looks like the photo is in Sun Valley! I’m heading over there Monday — if I see you, I’ll give you my review in person! Thanks for posting. What a perfect bowl of soup! I definitely need to get my mitts on this cookbook! Looks amazing!! Such a fantastic book. 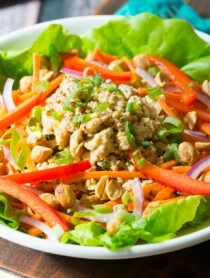 There is nothing skinny tasting about this lightened up meals. Great recipe :) it sounds delicious!! I just ordered Gina’s book! This looks great, I can’t wait to see what other wonderful recipes await! 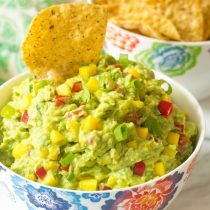 I’m loving all of these delicious Skinnytaste recipes! Thanks for sharing, Sommer. So proud of Gina! Gina’s book looks amazing! Can’t wait to get a copy. And this soup…perfection!! I can’t wait to get my hands on her book!! This recipe looks like a keeper! Love Gina’s new cookbook! So many fabulous recipes! The soup looks great!